The 2014 spring season of mountaineering on Everest had more to do with politics, advice fame, power and positioning than mountaineering. These agendas dwarfed the deaths of 19 people. The final summit numbers will take months to determine but most likely will be the lowest total since 1997. From Tibet over 100 people summited. And from Nepal, six summits, albeit aviation assisted since the climbers flew to Camp 2 instead of climbing through the Icefall. This post will provide my analysis of the season, what went wrong along with ideas on going forward. These are my conclusions but with input from extensive post climb interviews with sherpas, guides and climbers who were there. For me, the tragedy of 2014 were the deaths of 19 people (16 sherpa in the Icefall, a sherpa who died from AMS, two sherpas who were killed returning home from base camp: one by lightening and another in an accident). The impact on the families of the dead will echo for decades to come. However, the insult of Everest 2014 is the way the deaths are being used to promote personal, national, press and company agendas through spin and selective reporting. The seeds of this year’s controversy have been growing over several years. On Manaslu in 2012, a few young sherpas, allegedly lead by Pasang Tenzing argued to end the season using threats and intimidation after an avalanche killed 11 members. Many teams left the mountain not only fearing the objective hazards but also this new generation of sherpas. On Everest in 2013 controversy erupted after the fights between European climbers and sherpas fixing the rope on the Lhotse Face. A few young vocal sherpas lead an inexcusable attack at Camp 2 on the Europeans bringing global attention to a new generation of sherpa climbers. In recent years, new Everest guiding companies were formed in Kathmandu with their primary selling point being that they are not western owned companies. In 2014, over half the members guided up Everest were from local Nepali companies. Every non-Nepali company who guides on Everest uses a local company to organize logistics, hire staff and support the expedition. It has always been this way. In many cases, it is up to these local companies to set sherpa pay, benefits, life insurance, etc. ; not the foreign companies companies. There are few if any written employment contracts. Some long time foreign operators do dictate pay, and that is not where the problem lies. To be blunt, some foreign operators don’t know what their workers are really paid or the amount of the life insurance. They pay a single per climber fee and assume the middle man will do the right thing. Local companies appear to have unlimited flexibility with no oversight or checking if policies are being met. The Nepal Government, embarrassed by years of stinging criticism over trash, safety and general order, floated idea after idea since 2013 to better manage the mountain. The suggestions generated even more uncertainty and criticism as most ideas were under developed, unnecessary and then not implemented. A 2013 article in Outside Magazine entitled “The Disposable Man” brought the world’s attention to the risk sherpas encounter while climbing Everest. While a balanced article that brought up the low life insurance issue, the provocative title lead many readers to an improper conclusion and unfortunately it focused on the risks from a statistical perspective and failed to put the overall role of sherpas into perspective. That article has been used countless times to support an accusation of sherpa exploitation and abuse. With all this as background, the deaths in 2014 have brought a power struggle over Everest into full bloom and the damage is severe. The current blame game is not only disingenuous but also potentially damaging to all involved. It is time to stop the sound bites with interviews and think deeply about the problem and the solution. On April 18th, 2014, 16 sherpas were killed in the single most deadly incident in Everest’s history. The deaths came when a well-known ice serac hanging off the West Shoulder of Everest released at 6:30am just as droves of sherpas were carrying loads into the Western Cwm from Everest Base Camp. They were bunched together, delayed after a ladder crossing a crevasse was just repaired, but underneath a known hazard. The gathering broke a common mountaineering safety practice of spreading out under known danger. When ice released from the hanging serac it was large, fast and deadly, they never had a chance. 13 bodies were recovered, multiple sherpas were rescued but three remain buried in the deep crevasses of the Khumbu Icefall. As tragic as these deaths were, the death toll could have been much higher as there were over 150 sherpas in the general area at the time of the release. The deaths set off a domino effect of reaction, decisions and implications that have yet to be understood. The blame game has intensified to the point of threatening the very survival of Everest climbing and the livelihood of the climbing sherpas. While the trekking industry brings in more money than mountaineering, without climbing, Nepal loses it leadership in the climbing world and many, many Sherpa families would suffer. Similar to the previous two years, a few young sherpas lead the chant to stop climbing. I want to be clear at this point, it is not all the young sherpas who are part of this so from this point further, I’ll call the few (under 5 in total) the instigators. I wrote just after the deaths that there were three reasons for stopping climbing for 2014: respect for the fallen, fear of more ice releases and demands for more money through increased pay and life insurance. In reality, there was only one real reason – money. Today I would add another reason – desire for control over Everest climbing. In general, the new generation of sherpas are quite different from their fathers and grandfathers. They have more western style education, they are more ambitious, they do not hesitate to show their emotions. About two dozen have attended mountaineering certification courses based on the UIAA curriculum and are now certified by international organizations as guides but to a different standard than accreditation given elsewhere in the world. But for a few climbing sherpas, this acknowledgment has justified demands for equal pay and ment with western guides. To be clear on this point, a lead guide is paid more due to his/her responsibilities, for example the logistical aspect of getting all the gear and people to base camp, the administrative tasks and balancing the books. A western assistant guide is not paid as much as a lead guide. Immediately after the deaths and during a formal period of mourning where most sherpas returned to their homes to be with their families, the instigators generated a list of demands addressed to the Nepal Ministry of Tourism and Aviation, the government agency that controls mountaineering and trekking in Nepal. According to Russell Brice, it appeared the list was created before the incident. An initial offer of $400 compensation for the families of the dead was seen as an insult as was the current level of life insurance of $10,000. There is no cap on life insurance for sherpas as has been widely reported. But this was just the beginning of their grievances. As was clearly demonstrated this year, the instigators knew how to use the press to their advantage and were not afraid to use their voice. Many grew up in a militant environment where Maoist doctrines showed them that threats, intimidation, and violence yields results in Nepal. The press loved to spread the message of discontent and helped, perhaps unwittingly, to fuel the blame game. The elder Sherpas and other ethnic climbers, porters, cooks and support staff seem to have lost their voice, and influence, in Nepal’s current climbing culture. This passiveness is having significant consequences on their own future. As the world focused on the deaths, a bigger picture emerged as the instigators began to tell the world that sherpa lives were not valued, they were overworked, put in risky roles. Sherpas not living in Nepal joined in the outrage showing a solidarity. There are many sherpa living abroad who have traditional western jobs but are tightly connected to their families in Nepal making annual visits and sending money. The identity of any Sherpa is his ethnicity, and whether he climbs mountains, or drives a cab in New York, his first identity is always his ethnicity, and the connection to Nepal. Therefore, for better or worse, every ethnic Sherpa around the world feels he has some stake in the way climbing Sherpas are ed. “The long-running exploitation of the climbing Sherpa was exposed by the horrific April 18 avalanche. All of a sudden climbing Everest is not as cool any more. This epic disaster has had worldwide impact. Will it last? My personal hope is that anyone who wishes to climb Everest or any other mountain in the future will have a clearer understanding first of the economics of their choice. Although the Government of Nepal is an easy target and has become the punching bag in the past month for the grievances, standing in the shadows are expedition operators who profit handsomely. They marginalize and at times intimidate climbing Sherpas, most of whom have little education and no one who speaks for them. Norbu is a vice president of the American Himalayan Foundation and lives in the US. This theme of sherpa exploitation and inept climbers has been picked up by the media, outside of the climbing community, and amplified by such notables as Jon Krakauer with a recent article in the New Yorker. For the record and my opinion, the notion of blaming the customer for ing a defective product rarely works. The sherpas are not being exploited, no one is pointing a gun to their head, their labor is not used to fund warlords as in blood diamonds – comparisons are inaccurate and not helpful and fuel polarized positions that encourage entrenched viewpoints. This is not healthy. I do agree with Norbu on this point: it is up the each member climber to understand how their guide runs their business from sherpa and staff pay to how they are ed, starting with insurance. Of course, transparency has not been a strong suit in the climbing industry. All deaths in climbing are tragic but they need to be kept in perspective. The reality is that ‘members’ and ‘hired’, using the Himalayan Database terminology, suffer about the same death rate. The facts from 1923 to 2014 are that from the Nepal side of Everest, 2,215 members have summited with 77 deaths or 3.5% and 2,150 hired have summited with 82 deaths or 3.8%. All tragic and no excuse not to take action. Back on Everest after the deaths, the Nepal government responded as it always does with Everest – either ignoring the real issues or with empty promises of action. The climbing community, and the angry sherpas knew better. At Everest Base Camp, the drum beat became louder to stop all climbing. Credible reports of threats to other sherpas emerged. Some western companies had communication cables cut – an implied threat. Western operators became worried about their staff and their members. Russell Brice reported that his Sidar Purba Tahsi, with a record 21 summits, was threatened to have his and his sherpas legs broken and homes burned if they continued to climb. Last year, the same few instigators had mobilized the other sherpas during the fight and that same cloud now loomed over this year’s threats with true fear. In some camps, the very people that members had trusted their lives with, were now feared. As many of the sherpas were still in their villages, the small vocal contingency, aka the instigators gained momentum in shutting down the season. Joining the cry to stop climbing were the families of the sherpas. Wives begged their husbands not to return, mothers demanded that their sons find new work. The pressure became immense. Other sherpas, knowing their incomes, and perhaps their future, were at risk stayed at base camp, hoping to continue climbing. They told members they would climb. They supported their operator’s effort to find a solution. A division amongst the sherpas emerged, old and new. Two western operators, Russell Brice and Phil Crampton spent $6,000 each of their personal money to fly to Kathmandu along with Guy Cotter who was already in Kathmandu to meet with government officials ing to bring back an agreement in writing that would allow the season to continue while improving compensation for the sherpas and showing respect for the dead. The meeting went well according to reports but no document was created. Some sherpas criticized the westerners for getting involved, others applauded their commitment. The cynics saw ulterior motives. While they were flying back to base camp to deliver what they perceived as encouraging news, the largest western operator, IMG, announced it was ending their season. Safety concerns in the Icefall was the given reason. Without their 100+ sherpa team to help fix lines to the summit, the other operators were left with few options. A few guide companies, including AAI and Adventure Consultants, had lost several of their top sherpas. Both sherpas and members were devastated. Under these circumstances, they felt they had no choice and also ended their season. The season’s troubles continued to accelerate. The instigators, now firmly in control, increased their threats towards other sherpas, including the mission-critical Icefall Doctors, to stop climbing. With no support in the Icefall, there would be no climbing, a strategic and effectively shrewd move by the younger generation. One by one, guides ended their season, members left for home, their sherpas never came back from their villages. Everest Base Camp became an open airport with closed runways. The Nepal government, seeing that they were losing the public relations battle, sent several high ranking officials from the Ministry, plus mountaineering and trekking agencies, to Everest Base Camp. Meanwhile, outrage around the world grew focused on the climbers aka members, their roles. Multiple stories discussed the risky business of being a climbing sherpa. Outdoor magazines joined in the frenzy decrying today’s Everest climber as selfish, unskilled and dangerous. They opined to return Everest to the 1960’s with small teams of “professional” climbers. No mention of sherpas support then or in their future vision even though sherpas have been part of climbing Everest since the early 1920’s. Relief funds emerged from individuals to corporations asking for money to support the families of the dead. One effort raised over $400,000 for the 16 families and 28 children left behind. The Nepal Government agreed to raise the life insurance to $15,000. The light was now shining firmly and brightly on Everest, the sherpas and the climbers. Fearing retribution, and anger back home or out of sheer exhaustion, few climbers who were there spoke publicly. Those who did were captured on live television interviews and in extensive print reports. Sound bites took center stage. The real story was too long for the evening news. First time climbers became experts on a century of Everest, trekkers spoke as summiters. The media loved the spicy quotes. Only a few guides spoke about the incidents, perhaps fearing an impact to their business. Those who did, spoke strongly about the realities of today’s Everest environment and the impact of the few young sherpas. Guy Cotter, who has been involved with Everest more than 30 years made this statement about sherpa ment and pay. Adventure Consultants had three climbing sherpas die. “It is because of all this that I take offence to some of the diatribe from uninformed sources who would have everyone believe the Sherpas are being exploited. The Sherpas are moving rapidly forward with their own destiny unfolding before them in a very positive way. They are very much in control of that momentum that will see them succeed. Yes the accident on Everest this season was extremely tragic; we who live our lives in the mountains must frequently balance the euphoria of a shared success – with the intensity of tragic loss. Please read the entire newsletter. The high ranking officials who landed at Everest Base Camp were anticipated to deliver the final blow to the season, closing it out of respect to the dead and safety considerations, but money rules. One Western guide, Tim Ripple of Peak Freaks lead a blog post with the headline “Everest Officially Closed”. Through my sources, I did the same. We were wrong. The government official said the opposite, all was well and keep climbing, “Everest was Open to All”. The Government offical spoke in Nepali to the sherpas, no English translation was provided to the remaining members. Some in the 200 person crowd cheered, other called to stone him. He returned to Kathmandu promising to work with the sherpas for better working conditions. No one believed him. They issues a press release to back up the rhetoric. The operators now seeing it was pointless to try to continue climbing, even though many of the remaining sherpas said publicly they wanted to continue, were left with little choice but to end the season. The Everest Haters, found red meat in this action, using it as further evidence that today’s Everest climbers (and the Haters reject even using the term climber) were incapable of attempting Everest without the support of the sherpas. They were correct. 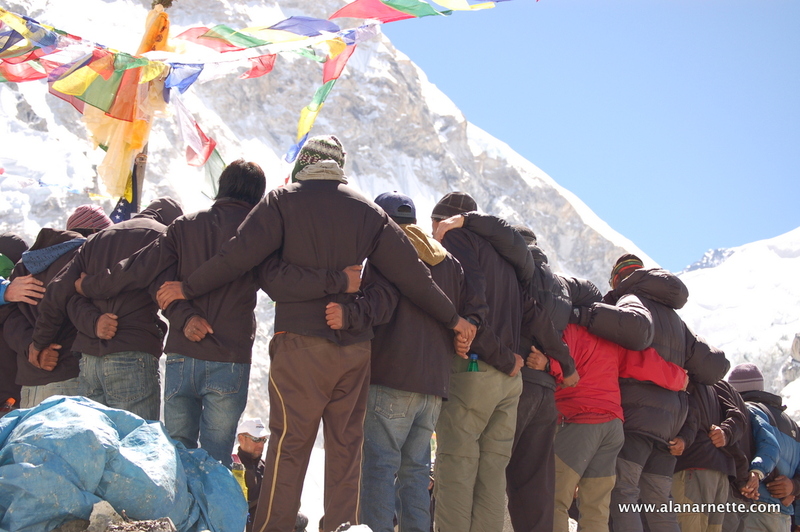 No team came to Everest in 2014 or in the past without organizing the support from the climbing sherpas. This was the model. This was the expectation. Even professional climbers assumed ladders would be in place across the deep Khumbu Icefall crevasses. As base camp emptied, a few small independent teams remained crying out with entitlement and indignation that they would not stop their summit efforts, blaming the “commercial mafia” for ending the season and denying the dangers and ignoring the request for respect for the dead. Fame and ambition were more powerful than dignity. The instigators continued to threaten the Icefall Doctors who had stopped maintaining the Icefall ladders and ropes. The Doctors reed to the closest village promising to return if needed, but again, few believed them. The only consistent presence at Everest Base Camp were the physicians at EverestEr who did an amazing job along with other expedition physicians in ing the injured from the accident. They never left and never gave up. If there are heroes from 2014, they are the doctors, the professionals and sherpas who put their own lives at risk, without question, to immediately respond to the tragedy on April 18th. Meanwhile on the other side of Everest, teams made progress. The Tibetans who control that side of the mountain under the tight control of Beijing, had set the fixed line to 8300 meters or Camp 3 before strong winds stopped progress. Climbers who had wanted to switch from the south to the north were refused permits by the Chinese, continuing a very troubling practice seen earlier in the season – refusing visas and climbing permits, especially to Americans. Some speculated it was retaliation for the U.S. allowing the Dali Lama to visit a few months earlier. The sherpas climbing on the north or on other Himalayan mountains like Shishapangma, Cho Oyu or Makalu continued to work while grieving for the loss of their fellow climbers suggesting an independence of thinking not seen in Nepal on Everest. Two women on the south side came into public focus. Cleo Weidlich who wanted to climb Lhotse spoke out loudly that she would climb with or without ladders or sherpa support. Jing Wang, a wealthy Chinese woman, was trying to set a female speed record for the 7 Summits plus both Poles. She had been with Himalayan Experience and asked Russell Brice to continue supporting her. Brice refused but he was still caught in a political crossfire with the Ministry. Wang found a new operator to take her money. She hired five sherpa who had never summited Everest plus two cooks. She found a helicopter company to fly her over the now-unsupported Khumbu Icefall and dangerous crevasses of the Western Cwm to Camp 2. The Ministry said she was not authorized to fly to that Camp, saying helicopter flights were only to be used for rescues and authorized exceptions like they had granted to western guides the previous week to secure gear left in the Cwm after the season effectively ended. Weidlich arranged a similar sortie’ that included a reported two sherpa to support her after saying she was going alone. Back in the western world, newspapers were now interviewing sherpa leaders and western climbers. The headlines read as expected describing Everest as a circus, out of control and in need of serious change. They were right. The summit weather window began to emerge for May 24, 2014. High winds and heavy snow had delayed climbs all across the Himalayan this spring season. In some ways, ending the season from the south with 350 members and an equal number of climbing sherpas was a blessing in disguise. A two day summit window for that many people was the perfect storm for crowds and death. It could have been a repeat of 2012. On May 23, the first Everest 2014 summits were announced. Not from the north but from Wang and her five sherpas. They left at 9:00am and summited at 6:30pm. Her accomplishment was met with a range of reactions. Weidlich abandoned her effort saying she “never intended to claim a summit” after using a helicopter to fly one third of the way up the route. On the north, Bill Burke, now 72 years-old, summited as did Poorna Malavath a 13 year 11 month old girl from India. The next day saw more summits, over 100 on the north, but those trying without supplemental oxygen were stopped demonstrating how difficult it is to climb the world’s highest mountain. Back in Kathmandu, Wang held a news conference to celebrate her summit and to announce she had donated $30,000 to local hospitals. The Ministry issued a preliminary summit certificate and said her helicopter flight was authorized, contradicting earlier statements. Local newspapers called her “legendary”. When asked about helicopters, she refused to comment but two days later said she never used a helicopter and had climbed the Icefall. Her helicopter pilot and new organizer said she had flown into the Camp 2. The Ministry said they would look into it before issuing a final summit certificate. Finally on June 6, she told Chinadaily she did take a helicopter. The Sherpas (guides) have great mental pressure and they were reluctant to step into that place. I knew our decision could discount the climbing efforts. However, I would like to accept the losses for the sake of safety. She left for Alaska to climb Denali and prepared to claim her record assuming the Ministry would grant her the summit. Personally I think she should not be awarded any record as she did not climb the same route as other record holders. The Himalayan Database, run by Ms. Hawley is reported to note Wang’s summit as “aviation aided”, a new category altogether. The loss of an Everest climbing opportunity pales in comparison to the deaths of 16 sherpa. Their priorities were clear. But the criticism continued with the most unstable fringe casting accusations of climbers being murders. The families of the dead were now beginning a new phase in their lives without husbands, fathers, son and brothers. And the sherpa community had mobilized to change things. At the center of the demands were increased life insurance, perhaps unlimited but certainly enough to support a family until they can regroup, maybe $50,000. The other demand was more nebulous, to reduce the risk for the climbing sherpas. Western operators had proposed using helicopters to fly gear into the Western Cwm for several years but were denied. The Ministry had suggested putting a ladder on the Hillary Step to increase safety but no action had occurred. Instead the Ministry had issued new regulations around trash, requiring each climber to bring rubbish down from above base camp. They now required an etiquette class for all climbers to prevent future fights. They loudly and proudly promised the world they would put a team of officials and military at base camp to maintain order and help with rescues. They did not follow through on this pledge this year. They raised the permit fee for each individual while telling the world they lowered it. They renamed sherpa, Sherpa Guides and suggested that every non-sherpa climber must be accompanied by a Sherpa Guide. It is clear, the Ministry enjoys the millions of dollars in permits that Everest generates but did not have the motivation or nuanced understanding to protect the mountain or the people who work there. The climbing culture of Everest has been always been changing. Today’s Everest is dramatically different than my first climb in 2002 and nothing like the culture of the days of Mallory & Irvine, Tenzing and Hillary or Whitaker & Hornbein. Criticizing Everest climbers and the industry has become a parlor game where everyone is an expert. The major themes for reform advocated by informed and uninformed sources can be grouped in three major groups: improved sherpa working conditions and compensation, reduce crowds, and reduce deaths. Everest, like all Himalayan mountains, are climbed today based on support from Sherpa and a few other ethnic groups living in Nepal and Tibet. Based on the early British and Swiss expeditions, it is well documented that sherpas have an outstanding physical ability to perform at high altitude. Tenzing Norgay had been on two previous Everest expeditions before climbing side by side with Hillary for the first summit on 1953. A safe assumption is he provided knowledge and experience the British didn’t have. History has recognized and acknowledged his contribution. 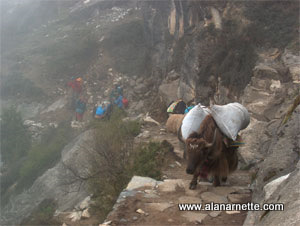 It is a mistake to use the term ”sherpa’ to include all non-members on the mountains. And in fact not every person in a support role is a member of the ethnic people known as Sherpa. There are Gurung, Tamang, the Hindu Chhetri caste, Rai and others. But I, like many people, now use the term sherpa (lower case) or sherpas to describe all the support people on a Himalayan climb. Maybe there is a better term such as mountain worker as suggested by Jamie McGuiness. As Everest became more popular, more sherpas were hired. Some dislike this comment, but they are often paid 10 times the annual income in Nepal for two months of work. A King’s wage. This is an economic fact that cannot be ignored. A worker in Kansas is paid less than one in New York due to the cost of living. The problem is the work is dangerous. Looking at the facts, 265 people (160 westerners and 105 Sherpas) have died on all routes on Everest from 1924 to 2013. The “mountain workers” have not taken the brunt of the deaths. In looking at insurance and pay, it is critical to note the different work roles. There are different support roles ranging from cooks and cook helpers to sherpas, who only carry loads, to sherpa climbers who only climb with members. Then some are sherpa leaders who make major logistical decisions aka sirdars or field managers and others who expertly manage the fixed ropes and ladders on the route. Finally there is a strong emerging group of sherpa businessmen who run their own companies and serve as traditional guides with no western contribution. The current support model has the sherpas establishing the camps on Everest for use by the members. It varies by expedition but some members will carry little, others will carry significant loads – it is a mistake to make a broad generalization that a member will “walk up the mountain with a day pack” or every sherpa carries loads more than their body weight. The real issue is that some sherpas will make 10X more trips from base camp to upper camps than a member. They carry tents, stoves, fuel, food, tables, chairs to Advanced Base Camp high in the Western Cwm. They also carry ropes, anchors and screws to establish the route with the nylon rope used as a safety line. They carry oxygen bottles used by themselves and members on the summit push. And they sometimes ferry a member’s down suit or sleeping bag to a higher camp. Some guides pay a sherpa a salary for the entire season, other pay on a per load basis where a sherpa can choose to take a double load (80-100 pounds) for more money. Almost everyone gets a tip from members but the amount varies widely. A sherpa who goes to the summit with a member gets a substantial bonus plus a large tip in most cases. Thus a support person can make between a $1,000 to $10,000 for a two-month Everest expedition. Some of the sherpa deaths over the past few years have been because the sherpa ignored safety rules, in other words did not attached themselves to a safety line in the case of a fall off a ladder or steep section that would be fatal. Another disturbing trend are the deaths of sherpas related to altitude. It is often mistakenly cited that their genetic background makes sherpa immune to altitude issues. Death from avalanches or a serac release like in this year are actually quite rare. 2006 was the last major incident in the Icefall involving sherpas where three were killed in the Icefall by the same ice serac. That said, each year, there are near misses and injuries related to ice and rock fall on both sides of Everest and around the world. Just last week it is assumed an avalanche swept six climbers to their deaths on Mt. Rainier. Back to the main issue after Everest 2014 – reduce risk and improved compensation; there is not an easy answer other than to stop climbing. Going back to the small teams of the 1960’s is not a realistic option, nor is requiring all climbers to meet a stringent level of skills proficiency. The demand is too high, the money too large. What is realistic is to require a scaled level of life insurance based on how high a sherpa climbs – perhaps $10,000 for base camp but $50,000 for a summit attempt. This would add a few hundred dollars for each sherpa covered – and passed on to the members in all likelihood. In terms of outright pay, perhaps a straight system of pay for work done that is based on skills, experience and risk. If you carry multiple loads you get more money than if you stay at base camp or one camp all season. Many reputable Western companies already use all these practices and pass through the increased costs to their members. Many local companies do not follow this approach. That is one of the many reasons why some companies charge $65,000 and other $35,000 for what appears to be the same product. My Sherpa staff are earning about $25 per day plus a bonus of $20 from BC to C1 and another bonus of $10 from C1 to C2. They normally go from BC to C2 and back again in one day, so they make $55 for this difficult and dangerous journey. As opposed to a typical journey from C2 to C4 and back again where they still make $25 per day; a bonus of $40 from C2 – C3 and a bonus of $70 from C3 – C4, in effect making $135 per day, admittedly a more strenuous day, but without the danger of the Icefall. For sherpas with larger roles, if they make major member decisions and have large responsibility, they should receive a commensurate compensation – regardless of where they live in this world. Again, the companies pay their lead sherpas in a similar model as their western leaders. The real issue is that anyone can call themselves an Everest guide, ignore the government rules and pay below market wages – and there are plenty of people who will do the work regardless of the pay or risk. And that is not the responsibility of the member. Reducing risk is more complicated. The most obvious way is to avoid the Khumbu Icefall altogether. In decades past, the Khumbu Icefall route was more to the center designed to minimize any impact of an avalanche off the West Shoulder, but in recent years the Icefall Doctors have taken it more towards the West Shoulder because it is easier and faster for them to do the work according to many long time Everest climbers. After this year’s disaster, there is now talk of avoiding the Icefall completely by taking a new route high on the shoulder of Nuptse. However, the simplistic approach to reduce risk is to lower the number of people who go through areas of known risk – the Icefall, the last 3000’ to the summit, etc. There are several ways of doing this – use helicopters to ferry loads thus eliminating human carries, reduce load weight and size so sherpas can move faster, not a popular idea to many. My favorite idea, reduce the amount of gear used above base camp and have members share in the load carrying. There is simply no need for tables and chairs at Camp 2 on Everest, or huge dome dining tents. These luxuries require multiple carries by sherpas thus increasing their exposure to dangerous areas. On Denali, climbers regularly spend three, five even eight days at the 17,000’ camp sleeping four to a tent, eating out of a simple cup and bowl while sitting on the ground. Why is Everest held to a different standard? On Aconcagua, everyone carries a share of the group gear – tents, food, fuel, stoves. There is no “support” staff. Why is Everest held to a different standard? If you need a chair at 21,000’, carry your own damn chair. If you paid $100,000 and expect a chair and table at Camp 2, you don’t belong on Everest. And if you need 4 liters per minutes of oxygen starting at Camp 2, you need to go home. Everest has exploded since 1996. There has been a steady rise in members, not only from America and the UK but most recently from India, China and Nepal itself. Adding to the crowds are the number of sherpas climbing Everest year. In the infamous picture by Ralf Duimovits, I estimate over half, if not 70% of those pictured are sherpa ferrying loads to the South Col. In 2014, there were 341 permits issued to “members”, or members, and about 400 climbing sherpas were hired to support them. In some years it is over 2.5 support staff for each paying member. The reason for crowds is simple, operators can attract more members by offering more support – 2 sherpas on your summit push, carry no more than a day pack above base camp, no experience needed than Aconcagua or Denali, extra oxygen. All of these conspire to inflate the support needed thus more sherpa, more people, more crowds. To reduce the crowds, reduce the support. That will not only reduce the number of sherpa working but also discourage marginal climbers. Six people die on Everest and it makes world headlines, six on Denali or Mont Blanc, it goes on page 6. Even the recent deaths on Rainier held the publics’ interest only for a few days. In comparison to the other 8000m mountains, Everest is relatively safe. There have been 6,358 summits, 265 deaths or a summit to death ratio of 4.1%. The highest ratios are on Annapurna and K2 at 35% and 26% respectively. Climbing is dangerous, now there’s a headline for the mass media …. It is the portrayal of the average Everest climber as that of a rich doctor who paid $100,000 to “be hauled up by a poor sherpa” that feeds this image. Mr. Krakauer didn’t help with some of his hyperbole in his selling book. By the way, the average price paid to climb Everest in 2014 was $42,000, half of what the press like to report. The reality is the average climber saves for years, makes sacrifices at home, takes out loans to follow a dream. But their story is rarely told. It is true that in recent years, some of the deaths came from inexperience, the case study being in 2012 where a young climber insisted on going to the summit against the advice of her sherpas, ran out of energy and oxygen and died on the descent. But other death stories never get coverage like my friend who died in 2011. He was experienced, skilled and fit. In all likelihood, it was a stroke that killed him and could have happened at home, much less on Everest. To reduce deaths, you need to reduce exposure to objective dangers such as rock fall and avalanches as discussed previously. But there is also a measurable risk that cannot be avoided when climbing. Each person, member or support staff understands this and accepts it each time they step onto a mountain, or out of the house, or out of bed in the morning. To climb Everest is to accept the risk and assume more personal responsibility for your own safety. Safety can definitely be improved on Everest through the use of more radios, tracking climber locations, better routes, staffed and qualified rescue teams, but it will take unprecedented cooperation between government and commercial operators to enact new rules and policies. Everest 2014 has brought out the many areas where “Everest, Inc” needs improvement. But I am doubtful anything will happen. 2014 was not only a tragedy for the sherpas but a Nepal Tragedy of major proportions. There is too much enthusiasm around blaming everyone. There is little willingness to accept responsibility. The Nepal Government needs to step up and manage the world’s highest mountain like the treasure it is. Stop the corruption, stop the indigent and biased attitudes and do your job of providing a predictable, safe infrastructure at a reasonable price. Let the operators store gear in the Cwm, consider new routes on Nuptse to reach the Western Cwm; be open to new ideas. Manage your local operators in a professional manner. Enforce and implement your own rules. The Operators need to stop the silliness associated with attracting members – no more helicopters for members in and out of base camp. Stop the 5 Star European chefs and sushi. Stop telling people it is an “easy climb”. Stop giving so much support. Cut back on the oxygen. Be stricter with whom can be your member. Just because you summited Everest 5 times, doesn’t mean you should accept a member who has only managed a trekking peak. No chairs at Camp 2! Low-end operators, take notice. Yes, you want to grow your business but don’t do it by offering rock-bottom prices, paying your staff peanuts and asking them to take risks you wouldn’t. Run a professional business with quality gear and staff. Pay the wages, get the proper insurance and pass the costs on to your members. If they balk, they shouldn’t be your member. You are destroying your own business with today’s practices. The sherpas need to take responsibility for their own livelihood. Stop blaming the Government, operators and members for the problems. Take advantage of climbing schools like the Khumbu Climbing center to learn skills and safety techniques before accepting a job. If there are grievances, work them out before the season starts or give notice the season will not start. To hold others hostage is not professional or effective. Be selective about who you work for as every operator is not the same and some are willing to risk your life for their profit. The members need to stop expecting Everest to be a Disney cruise with plasma TVs and wine at base camp, soft mattresses at Camp 2 and unlimited oxygen starting wherever they want. They need to become climbers, to assume personal responsibility, accept a share of the load. And if you go with a lowball operator, please tell your family not to complain if you die. The media needs to take responsibility for reporting accurate, non-sensationalized stories. Stop the “if it bleeds, it leads” nonsense. Cover something about climbing other than deaths. How about following a dream? Show some diversity of thought. Become responsible. And stop telling the world that climbing needs to revert 100 years – it’s not going to happen. Haters need to calm down. Put your energy into something else. Most haters don’t have a clue about Everest or climbing. They are just repeating tired old lines like a parrot. If you want to join the discussion, become informed, get some experience and then climb Everest. Only then are you qualified to join a conversation on how to “fix” Everest. And as for me, I need to get on with it. Each April and May, Everest takes up 4 to 6 to sometimes 12 hours a day of my life. I respond to endless emails and comments trying to share through my blog what I know based on my experience and perspective. I enjoy this process but this year it was no longer fun. 16 people died on April 18th. It shook me to my core and made me question if I wanted to ever climb again. I thought a lot about those 16 widows and 28 children. I did what I could to help them through promoting the facts and funds where people could contribute. I hope blogs like this may encourage changes so no other family will go through the horror they are now living. As I wrote in the article, “I am proud to be called a climber”, I will climb again. I will climb K2 with Kami Sherpa starting next month. We will try to apply some of the lessons of Everest 2014 on that climb. And I will be proud to be climbing with a sherpa. Thank you for your excellent Everest wrap up Alan. I learned a great deal. I will now follow you with great anticipation for a smooth and successful K2 adventure! ROCK ON..
Well, no. Not literally. I HOPE. Considering the region, I wouldn’t be surprised, though. But is there really a difference between putting a gun to someone’s head and underpaying for someone’s (VERY important and VERY risky) services when the said services are his only means of survival. Guns kill quickly, hunger lasts. Read any climber’s blog. They ALL start with “Sherpas went first to set up the ropes”. “You can hire a Sherpa to carry your equipment”. They do the hardest and most dangerous work and get the least money. And yes, it’s YOUR responsibility as a consumer to know all that and refuse the questionnable services. You’re not “ing defective goods”. If you want a legal term, you’re knowingly ing goods manufactured in dangerous conditions. You’re aparently not objective and even less neutral. The gun comment is in response to some who compare climbing Everest with ing blood diamonds. I am a strong supporter of the Sherpa culture, my comments are intended to keep the discussion in balance. Everyone involved with Everest has significant opportunity for improvement. Sorry to loose you as a reader BlackBox. For one, that’s 5 deaths more, however you look at it. But more important is this. Imagine you have a war zone and two groups of people – kindergarteners and professional soldiers. Kindergarteners die quickly at war because they are helpless and weak. Soldiers are well-prepared, armor plated and die hard. Besides, they often die trying to save our hypothetical kindergarteners. My point is, if well-trained and experienced Shepra die at same rate as often ill-prepared climbers, doesn’t it mean that Sherpas are under more risk and do more work? I write to provide a critique of this perspective, not as a personal attack but as a rigorous examination of the opinions that many professional climbers and operators have expressed. As a climber and outdoor professional, I see that our “tribe” is deeply misguided regarding not only the people that are grouped together as Sherpas, an ethnic group distinguished from a labor category only by erratic capitalization, but also labor dynamics in general. This writing, and specifically the use of Sherpa/sherpa, reflects little attempt to gain a deeper understand of life as a Sherpa or life in the Solu-Khumbu. Climbers and many blog writers either have no knowledge of inflation or interest rates in the Khumbu (or other neighboring regions), or choose to ignore the real cost of living there. Let alone the discrepancy between insured and uninsured life, which burdens many, especially marginalized indigenous people, with debt when they are injured or sick. A Nepali working the entire climbing season, earning about $1,000-$5,000, would need many years to save money to pay for NMA/NMIA climbing courses – most use this money earned to support their families, pay for children’s school, and just plain live. There isn’t much left over. Nepal is not a far-flung exotic playground for climbers or anyone else, where “natives” are ignorant, violent and dependent upon foreigners. One thousand or five thousand dollars is not a “King’s ransom” in Nepal – this statement reflects Orientalism and white privilege. Suggesting that young Sherpa men are indoctrinated with militant values, which explains their desire for fair wages and a voice in their workplace – for many their ancestral home and backyard – again reflects a generalization that is as offensive as it is inaccurate. Your own dismissal of mountain worker’s labor disputes as “militant” also suggests neoliberal ideology that answers questions of human dignity with “fair and free market” rhetoric. I challenge the climbing community, as do many Sherpa, Nepali and foreign intellectuals, to more closely examine what the Everest industry is, and whose labor it is built upon. To be clear, I am not suggesting this labor is forced, but there are considerably constricting social, political and economic factors that limit the lives of those working as support climbers, sirdars, kitchen boys or porters. Climbers and mountaineers should also challenge themselves to gain a deeper understanding of these complex factors, rather than dismissing them. Best wishes. Shae, I actually believe we agree on many points. Note, many of the terms you use in quotes were not used by me. Shae, very academic. But not very expert in the world of expeditions… I’ve read Edward Said, too, you know. Well… Aren’t deconstructivist, post-everything discourses like yours aiming at debunking reality from… ideologies? Free of any bias? It is a noble cause, to fight for a “better life” for “oriental” workers, for sure. And I know nobody in the world of expeditions who is not in favor of that. But what you write here is full of ideology, neo-Marxist and also anti-this, and anti-that. You ignore everything about the world of expeditions, it seems. And you were not there on Everest, this past Spring, were you? Do you personally know the one Sherpa who is responsible for the cancellation movement? Check my cancelled film project’s website (TheChooyuproject) and you will see I know what I’m writing about! All criticism has been (Alan Arnette, Tim Mosedale, Russ brice, …) and is still aimed at exposing those “workers” who created chaos to defined ends – the dramatic accident was just used as an alibi. What is wrong in pointing at the fact that many Nepali, or Bhote, do in fact earn huge amounts IN COMPARISON TO THEIR FELLOW NEPALIS, IN THEIR COUNTRY? The first scientific evidence is to compare apples with apples? Hoina? I think there is a huge gap between researchers and others….but please when it comes to working conditions aand survival for your family “the world of expedition” has no meaning. It is more between the worker and the one commanding the work….and that can be found in so many places indigenous people working for foreigners. And on all of these places there are people calling for more! That is human and that is normal. most of these so calling climbers had never to fight for rights and money to give education. Get out of your tiny little world of climbers and look outside. Fighting ( wrong way or not) for its right as indigenous people is not so uncommon. Solutions have to be found accordingly. I wrote my last book (The Self-Destruction of the West, 2007) with a… Native American author (Ed McGaa-Eagle Man) – I know res life in the US and Canada. I publish on issues such as Sherpa buddhism, Kathmandu as a special religious place, or the holy mountains of Nepal. Not necessarily a “tiny little world”, eh!?!?! Thank you for this interesting paper. Your summary is a very good example the responsabilities we all should take. I just think, after all what I have read (comments and others stuffs), that most of people have no idea about Nepal and living condition there. Every day about 1300 people (mainly men) are leaving the country (not counting, people leaving illegaly or towards India) to Gulf countries, Malaysia, Korea, etc. They are leaving because of unemployment, very low wages, well… economic situation. E.g. a private driver in Kathmandu earns about 70dollars per month. The 200-500 dollars per month promised in Qatar look so much better. In Solukhumbu migration is not that high, because there is this Everest craziness… jobs are being found in the country. Which risk? dying in Qatar and the Emirates like about 400 Nepali last year? dying on the Everest because AMS or avalanche? Is it really enough to stop a man to think about feeding his family and give education to his kids? No because if he stays, how will he be able to support them? I think we cannot judge one’s choice. Everyone should stop thinking and saying for them what they have to do and what they should claim. We are all the same, human made of water and flesh and from that point of view every consideration about castes (not relevant at all) and other colonization-mind-like should just shut up. Everyone has to take his responsibilities for a better future on the top of the world with fair working conditions. Thanks Alan for this excellent analysis. Sums it up all very nicely. Good luck with K2. I have tracked Bill Burke’s climbs for years and am glad to have found your site this year. I have followed the season through the website and have placed my gratitude for its existence in the form of an Alzheimer’s donation. Thank you for your reports. I now have a new person to “track” and look forward to your reports from K2. thank you. your report is brilliant and has taught me a lot about Everest. I have been following your blog for the last two years, and while I am not a mountaineer (just a runnner and trekker) I really appreciate your articles and insigths . I am amazed by the energy you have and wish you sincerely all the best on K2. Will be following you ! Good reports, from Alan and from Russ, no question, yes… but I’m missing one crucial aspect: “What now?”, THE question Everest 2014 climbers are asking. Change must happen in the future, yes, but those who lost big this past season should not be forgotten. I am writing a book on what I call the “Everest 2014 Problem” and focus primarily on this aspect. I put the first chapter online, and it can be downloaded from the website I set up for a film project on… Pasang Tenzing Sherpa’s family (The Cho Oyu Project), some 6 years ago. So, I was on Everest and I know the main culprit; hence, I guess I have something to say… Do I need to state that I cancelled the film project? I guess not… I hope to complete the book and have it in Kathmandu’s bookstores by the end of August, early September. Good luck on K2, Alan! There, you will certainly meet Jamling Bhote, my friend and guide on… Everest 2014! Thanks Diveyesh. You have been a loyal follower for several years with great comments and additions to the Everest coverage. It would be nice to meet one day in person but until then, climb on! Thank you Alan for this informative and thoughtful piece (and for your coverage of Everest over recent years). I hope that K2 is enjoyable and fulfilling for you but please be careful. I like to draw your attention to a small piece of information. It was reported that Poornah Malavath of India at the age of 13years 11months climbed Everest from the North creating an all time youngest female on the Everest top.. You must be aware that when Jordan Romero of USA created record few years back by climbing at a tender age of 14 tears along with his father. This caused a furore about the mountaineering community from all over the world condemning such unnecessary risks for such young stars for creating records. As i understand, after this incident Chinese authority restricted the minimum & maxim age of climbers on Everest from North side. The minimum age was restricted to 16 years. Then how come, this climbing of Poornah Malavath got permission & accredition from Chinese authorities this year suddenly. Is this due to closure of Climbing from south this year & to encourage more climbing from north. However that seemed contradictory in view of their refusal to many climbers from the south side after the closure of climbing from that side. Have you got any idea about this incident? Please give me your considered opinion on this aspect. Time will tell Asim, but I am guessing 2015 will go on as if nothing happened in 2014 …. I was really relieved of the confusion & dilemma caused by the various comments from various sets of people from their angle which was not in conformity with your Earlier Blog covering daily happenings in Everest Climbing from South this year. The details mentioned in your blog aftermath 18th April’s tragic accident near Khumbu icefalls were not in conformity in many counts with Russel Brice’s Newsletter ,whose four parts were already published.. Hence i asked Kraig Becker of Adventure Blog to request you to give a full picture of the tragedy & aftermath & a detailed analysis of the events occurred afterwards & a possible future solution to avert future accidents & manage it more professionally. I am now overall satisfied after reading your detailed analysis covering all aspects of the incident & aftermath proceedings involving Sherpas, Nepali Government, Foreign & Indian Tour Operators, General climbers etc. What is your considered opinion about reopening of the Everest Expedition from the south side in view of so many if’s & but’s in 2015 & beyond? We,all mountain lovers would be eagerly awaiting for an amicable settlement with all concerned & resume the Everest Expedition from the Popular South route. . I like to point out to a confusion in your Total Ascent & Death statistics mentioned under the heading Reduce Deaths as 6358 Summits & 265 deaths. This seems to be erroneous by your own statistics as mentioned in February 2014 entitled “Everest by the Numbers: The Latest Summit Stats” where these figures till Spring Season 2013 was mentioned as 6871 ascents & 248 deaths. Would you be kind enough to clarify this difference in your two statements. Thanks & sorry for disturbing you for this trifling matter. very thorough article and thanks for not pulling any punches. it would be great if you could get this published somewhere in the general press. I completely agree with your perspective and, like Mark Horrell, think the media have distorted much of the story. The real tragedy was that 16 people died and some – a small minority – turned the situation into a political action. I was there and felt stung by the financial and time loss. Yes, I returned unharmed unlike the 16 people who died but I think their memories were not well served by the actions by these few. I intend to go back but I also intend to go back on my terms. Your perspective about changing the expectations of climbers would do a world of good – not just on Everest but on every other hill. People get caught up in the objective and forget that climbing is akin to roughing it. If someone wants pampering, they ought to go to the beach or on a cruise. Reduce the frills and the memberele may change; reduce the access by increasing the climbing fees and the memberele will certainly change and not for the better. Many people want to impose a series of restrictions on the mountain (e.g., a list of required summits before attempting Everest) but those restrictions will only change the access of Everest to the rich and exclude those of us who have adequate experience but limited money. I worry that the latest events may foster the wrong policies. Hopefully, I am wrong. Thanks for the great summary. Everest 2014 is over for me. I’m focused on 2015 now. Good luck on K2. I intend to follow your blog and cheer you on. Excellent summary ! you can be proud to be a climber. Good luck for the K2 ! Thank you for this strongly worded and powerfully written post. It’s good to have people like you fighting back against grotesque media distortion. I thought I would never be able to forget the image of all those bodies being brought out on long lines, but as you point out those with other agendas somehow conspired to make the tragedy a side show. Shame on those who did, and thoughts with all those who died and their families. On a (less important) personal note, thank you also for highlighting the unhelpful agenda being pursued by Outside magazine. I was one of a number of people mentioned in the Disposable Man article (a title that makes me cringe) with the erroneous implication that we don’t care about the welfare of the staff we hire. Like you I saw that article cited on many occasions as gospel truth that Sherpas are exploited, but I didn’t say anything because people might think it was personal. In fact our Nepali operator, a kind-hearted and decent person, was far more upset by the article than I was. And you’re right about some people wishing we returned to what it was like 100 years ago. I might add that often they have no idea what things were like on early expeditions. Only last week I read a piece in The Economist of all places that began with a romantic eulogy in praise of Tenzing and Hillary’s climb in 1953. Then without a hint of irony it launched into yet another of those tedious diatribes about how Everest has now become the world’s highest garbage dump. The writer appeared to be blissfully unaware that while nowadays nearly everyone packs their trash out with them, when Tenzing and Hillary returned from the summit they simply collapsed their tent on the Southeast Ridge and dumped it there, as everyone did back then. These so-called respectable publications need to start commissioning articles by people who have a clue. One final thank you – for linking to my blog. Good luck on K2. It will be an amazing achievement if you make it to the summit, but most of all make sure you come back and tell us about it. This must be the finest article on Everest 2014; balanced, realistic and rational. Brilliant! Spot on with the comment to minimize the luxuries above the icefall. I also appreciate the various links to other commentary at the end. Conrad Anker’s perspective was especially good. Thanks for providing balanced and insightful coverage again this season. Best wishes on K2! Although Conrad Anker was wrong about the mountain being closed out of respect for the dead. This was a misconception I have seen trotted out repeatedly. Perhaps one or two operators like Alpine Ascents who lost many Sherpas had no choice but to go home for this reason, but I didn’t meet a single climber who didn’t want to keep climbing, and there were plenty of Sherpas who were prepared to stay and help them. Make no mistake, the mountain was closed because of threats and intimidation by a small number of militants. Thank you for your efforts this season Alan. Maybe not fun this year but your commentary is truly valued by many amateurs and experts alike. I will be following you on K2 with keen interest and sincerely wish you a safe and successful climb! I wish Kami Sherpa, you and all yours (both of you) a safe return from K2, with the bonus of summitting in goor order. A great analysis and summary. Thank you. I think there is a difference between providing a comfortable base camp and a comfortable C2. Making base camp pleasant involves hard work and expense but not danger. I do find it mystifying that people believe paying more money solves the problem. The true problem is danger and the risk of dying. There isn’t a price that makes dying worthwhile. Storing gear at C2 and allowing helis to transport gear there greatly reduces this risk. This is a comprehensive and balanced report. Thank you Alan. I especially like the ending wherein you made direct suggestions to everyone involved on how they can improve the situation on Everest, and other high mountains.